It was actually very cold and rainy the first few days in the Spanish countryside. Something which none of us were prepared for. I had only packed a carryon sized suitcase as I was flying via RyanAir later in the trip. This meant limited clothing and I packed mostly for a sunny holiday in Spain in June. I only had one sweatshirt and one pair of Lululemon yoga pants (intended for the plane ride home), which I had to wear for three days before it warmed up. Sometimes the rain meant having to stay inside for one to one’s, which could be very difficult, having twenty-five conversations occurring in the same common room. 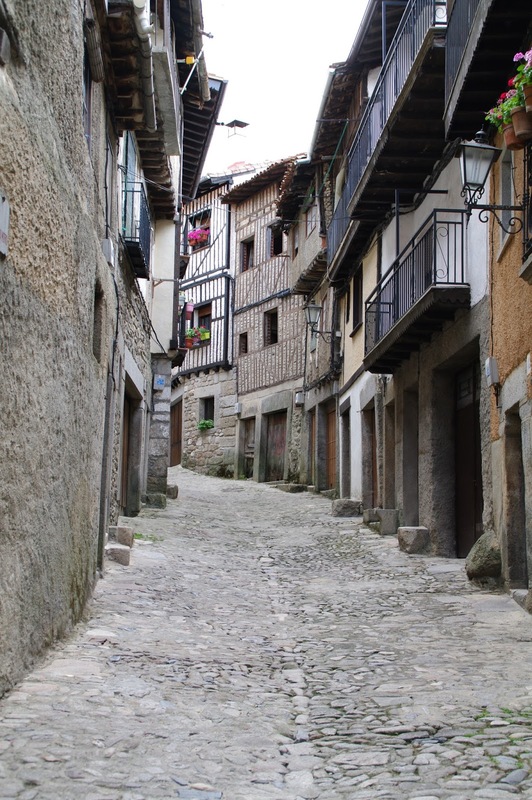 On our one to one’s we would often walk down a path leading out from the back of the hotel, which connected with an old carriage road into the small village of La Alberca. On one occasion we actually saw a couple walking their pet goat! During the siesta on the second day of the Pueblo Inglés program a group of us walked into the village together. The village looks like something out of a fairytale! It is very pretty, with little cobbled streets and baskets of flowers spilling over each balcony. It think it’s lovely that it is still in use today.